Current Status of Biosimilars in the United States - IMPACT Pharmaceutical Services, Inc. In March, the FDA approved the first biosimilar for the US market when it approved Sandoz’ Zarxio as a biosimilar for Amgen’s Neupogen. Then, in late April, the Agency finalized its Biosimilar Guidance Documents, which have been in draft form since 2012. As all good drug development professionals know, we must look at the relevant FDA guidance documents when designing an effective drug development plan. The publication of these 3 Biologics Guidance Documents removes any ambiguity which can arise from the use of draft documents. Before we can understand why the FDA has been very deliberate in the release of its final guidance documents concerning biosimilars, and its approval of biosimilar products, it is important to understand an inherent difference between biosimilar products and generic drugs. Generic drug products contain the same active pharmaceutical ingredient as the reference drug product whereas a biosimilar product is a highly similar product to the listed reference product. This subtle differentiation arises from a fundamental difference in the manufacture of drugs and biologics. Theoretically, a skilled chemist could synthesize the active pharmaceutical ingredient of any approved drug because the raw materials can be purchased, the necessary equipment can be procured, identical in‑process controls can be established and the exact synthetic process can be followed. Once the product is synthesized, its identity to the innovator drug can be established analytically. In contrast, while a skilled molecular biologist, theoretically, could replicate all of the conditions needed to produce a very similar biological product, it is impossible to produce an exact replica of an approved biological product. This is because biological products are produced in living organisms. The inherent variability of living systems necessarily results in products which are not identical to the original. The level of expression of the same gene under identical conditions is shown to vary considerably when the gene is expressed in BL21A1 cells (lane 2) and BL21(DE3) cells. S. Salunkhe et al., J. Microbiol and Biochem Technol., 1(1), 2009. The SDS-PAGE analysis above demonstrates this principle. As shown in this figure, the expression of the same gene by similar BL21-bacterial cell lines under identical conditions results in profoundly different levels of the gene product (SAK-IFN). 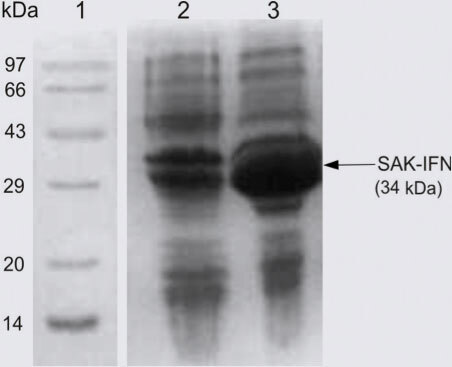 Clearly, the amount of product is different, as shown by the larger band at 29 kDa in lane 3, but also there are differences in the expression of other proteins, most notably those which are lighter than the desired product. Biosimilars, therefore, are highly similar versions of approved and authorized biological medicines but they are not identical. Rightfully so, the FDA is concerned that the relative lack of identity may lead to differences in performance in the clinic. Therefore, the suitability of biosimilars as substitutes for approved products must be supported by rigorous analytical, non-clinical, and clinical testing intended to demonstrate sufficient biosimilarity in structure, function, efficacy, and safety. Of course, both generic drug products and biosimilar products are comparable to the reference drug product in dosage form, strength, quality and performance characteristics, and intended use. The “interchangeability” of biological products will be the topic of a forthcoming blog – stay tuned! As mentioned above, in April, the FDA finalized 3 guidance documents which are intended to assure that biosimilars meet the standards necessary with respect to structure, function, efficacy, and safety. The first guidance document defines terms-of-art that are specific to biosimilars and details the expectations of the FDA for approval of biosimilars. In this document, the Agency discusses the possibility that pharmacodynamic data may be needed for approval in addition to pharmacokinetic and extensive analytical data. While the inclusion of pharmacodynamic data in the approval process will be determined on a case-by-case basis, the articulation that pharmacodynamic data may be needed clearly differentiates biosimilars from generic drugs. The second guidance document, largely, is devoted to the manufacturing and production concerns that companies need to address in their approval submission. The third guidance document provides guidance on the scientific approaches necessary to demonstrate biosimilarity, including discussions concerning the pharmacodynamic data which may be needed to gain approval. A unifying theme throughout the 3 documents is the need to have detailed interactions with the FDA in order to streamline the biosimilar development program. The approval of Zarxio as the first biosimilar in the United States, coupled with the finalization of FDA Guidance for Industry documents addressing biosimilars, suggests that the US is likely to see the approval of a large number of biosimilars over the next several years. The arrival of biosimilars to the US medical community will have a significant and long-term impact in treatment options for the US population. Last September, FDA released the first edition of its “Purple Book” listing which lists biologic products currently licensed in the United States and their interchangeable biosimilars. The Purple Book is intended to be used in an analogous manner in the development of biosimilars as the well‑known Orange Book is used in the development of generic drugs. At IMPACT, we offer companies expertise in tactical and strategic biologics development including consultation services and the management of FDA interactions. If you would like to discuss your specific needs, please contact us or give us a call today at (919) 899-9248.